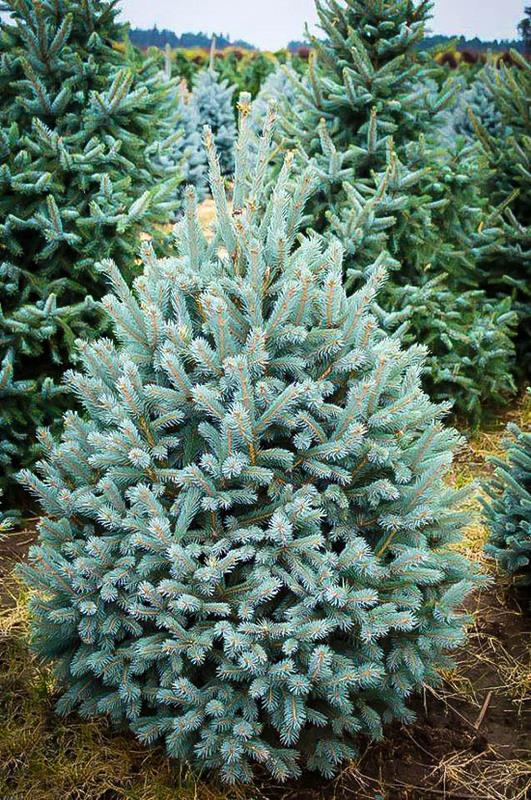 Paul’s Select Norway Spruce is a unique blue-needled form of Norway spruce. It is very winter-hardy to minus 40, and grows well in damper soil and climates than Colorado spruce does. It is tolerant of shade and stays dense right to the ground for many, many years. 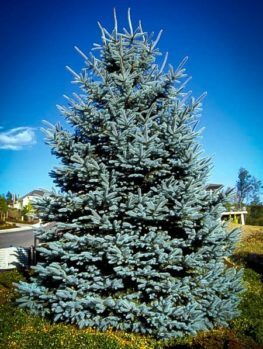 With its stunning blue needles, it makes a wonderful lawn specimen, an eye-catching background tree or a perfect wind-break to protect your garden from wind or tp screen ugly views. It grows rapidly to 15 or 20 feet tall, plenty tall enough for screening, but not too tall to overshadow the rest of your garden. It will grow steadily at close to 2 feet a year, so you will not be waiting long for that beautiful specimen or screen you dream off – and it will be a stunning blue one! 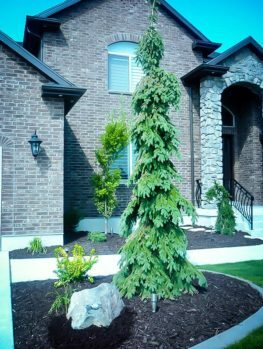 A sunny or partially-shade location is perfect for Paul’s Select Norway Spruce. It will even be content planted in full shade if it can reach up into the sun in a few years. Although it grows best in moist, rich soil, it will also grow well in almost any soil, including clay and compacted ground. It grows well in those damp parts of the garden, but once established it will tolerate normal drought well. Deer will normally leave it alone, and insects pests and diseases are also not problems. For a trouble-free, rapidly-growing plant of dynamic beauty, this is the choice you want to make. 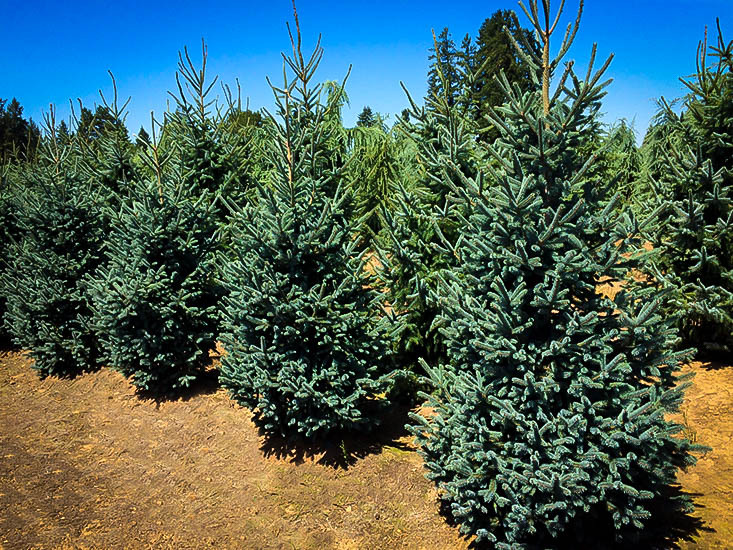 Blue-needled evergreen trees are iconic plants for gardens in cool and cold areas. These stand-out plants have stature, brilliance and beauty, combined with sturdiness, ease of growth and cold hardiness. They make ideal lawn specimens, background plants or screens around your property. They can even be clipped into more formal hedges in a range of sizes. In very cold areas the range of trees available is greatly reduced, so reliable plants take on extra value. Silver-blue is a very desirable color because it glows against green plants, and also against the snow, looking fresh and bright at any season. 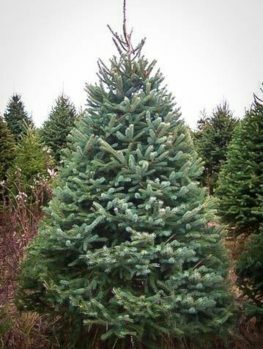 The most popular and widely-grown forms are blue Colorado Spruce, but that tree grows best in drier areas, so especially in cold places that receive lots of rain, something else is needed. This is where Paul’s Select Norway Spruce steps up and does the job. 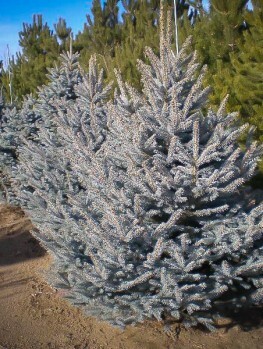 Almost all Norway Spruce are green, or perhaps blue-green in color, but this unique variety has vibrant blue foliage that rivals the best forms of Colorado Spruce. 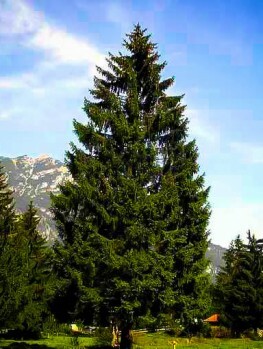 Besides its moisture tolerance, Norway spruce has many other advantages. Paul’s Select Norway Spruce will establish well in shady areas where it may take a few years to reach its head into the sun. While it grows best in moister soil, it is also tolerant of ordinary summer drought conditions. It grows well in all kinds of soil, from acid to alkaline and also in poor soil low in nutrients. It will even grow well in compacted soil, with its strong roots breaking up the ground and making it easier for other plants to establish later. Perhaps best of all, it is fast growing compared to other spruce trees, and it can add up to 2 feet of growth year after year. Oh, let’s not forget that it is almost never touched by deer, or by moles or mice tunneling under the snow and eating the bark of other threes. It also has no serious pests or diseases and quickly recovers from any minor attacks. 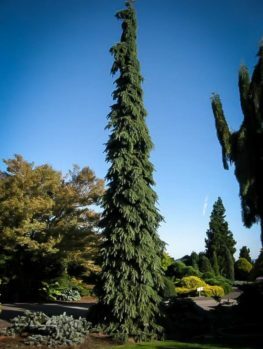 Paul’s Select Norway Spruce grows into a tree that quickly reaches 10 feet and eventually around 20 feet in height. It does not grow too fat, staying under 6 feet wide. 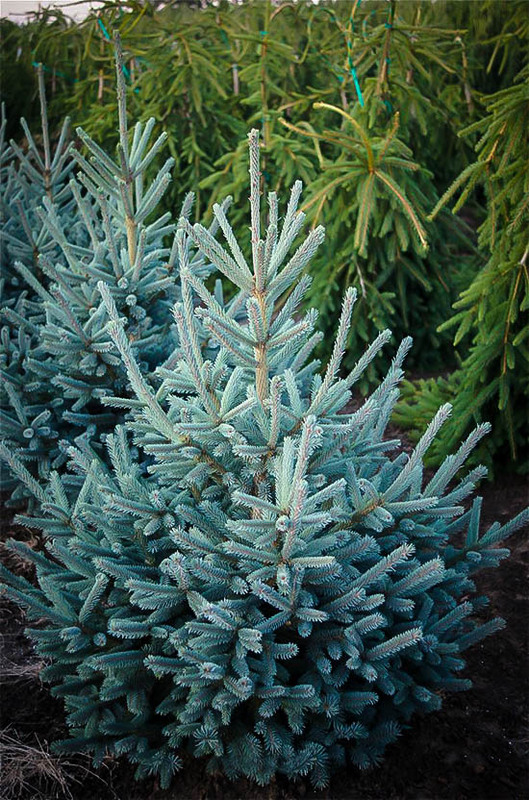 All year round the needles glow with a vibrant silver-blue color that is an outstanding addition to your garden décor. Unlike Colorado Spruce, the lower branches are retained right to the ground for many years, even if those lower parts are in shade. It has a naturally-dense compact pyramidal shape that needs no trimming to always look neat and beautiful. Planted as a specimen in the lawn it will bring joy every time you come home. If you need a screen or boundary row, then planted 3 or 4 feet apart it will soon fill-in and give you both beauty and protection. It is wind tolerant, so it makes a perfect choice for a windbreak. When planting your Paul’s Select Norway Spruce, choose a sunny or partially shaded location. For a screen or windbreak, place the trees 3 or 4 feet apart. Unlike broader trees, you can plant this tree as a specimen in a small area – just allow 4 or 5 feet distance from walls or buildings. 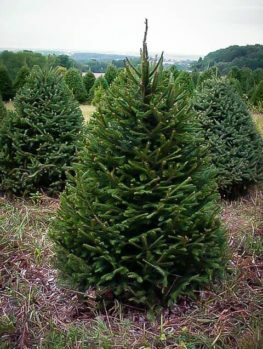 It needs no trimming to keep its pyramidal, upright form, but you can trim your trees in early summer if desired. Water your trees well regularly during the first season and after that only during extended dry spells. This tree will grow in most kinds of soil, including clay and low, damp spots. Norway Spruce (Picea abies) is a native tree in Scandinavia and north-west Russia, and some mountainous areas in other parts of Europe. It grows over 100 feet tall, but doesn’t grow very wide, and it is often used as a timber tree, because it quickly develops a thick, sturdy trunk. It is a long-lived tree, with some trees almost 500 years old. 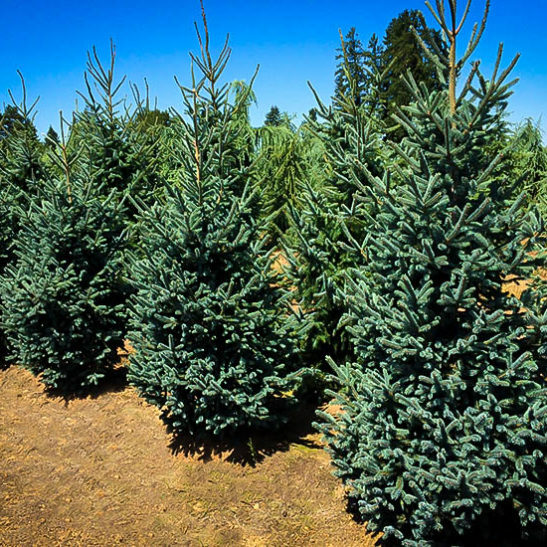 Although a relatively new variety, we do not know who ‘Paul’ was who selected this special variety, but we can certainly thank him for finding the only Norway spruce that truly has vibrant blue foliage all year round. Because this is a special, selected form of the wild tree, it cannot be grown from seed. Instead pieces are taken and joined to the roots of seedling Norway spruce trees and carefully grown into young plants. This takes time and skill, but this is the only way to preserve the unique blue coloring of this plant. 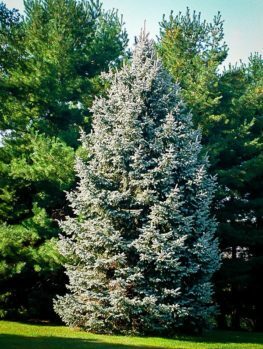 Cheaper seedling trees will be the normal green with perhaps a hint of blue in spring, as seen on other Norway spruce, and not this stunning beauty in year-round silver-blue.